WHAT IS SAR MAPPING ?? SAR stands for Synthetic Aperture Radar. So SAR Mapping means scanning a particular area or ground for moving or stationary targets by using the relative motion between the aircraft and the targets as a reference. Generally in AEWC&S and aircraft radar SAR mapping is used to detect ground threats and their numbers. The Phased Array(PESA) system can both track ground targets as well as Aerial targets. 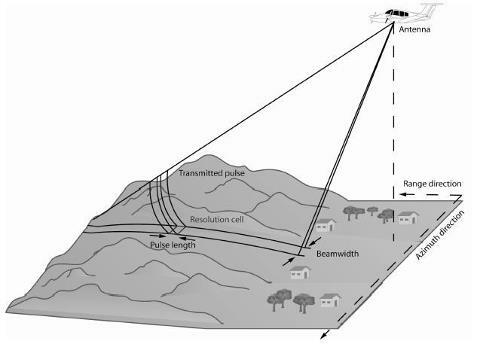 During tracking aerial threats the phase of the radar beam varies with time, whereas during tracking ground threats i.e SAR mapping the phase of the Radar beam varies with distance travelled (relative speed between aircraft and threat). This is the only difference between ground threat detection and aerial threat detection. The variation of phase during flight over the length of the synthetic aperture (Area of detection) is seen as a sequence of Doppler shifts of the received frequency from that of the transmitted frequency. This provides us about the RANGE of the target, the SPEED it is moving with, the DIRECTION it is moving towards and NUMBER of targets in that particular area. After processing the whole info from the shift in frequency of the received radar beam or DOPPLER SHIFT, the aircraft computer provides the pilot all these info in an organized and conventional manner through a Visual feedback system. Now-a-days all modern radar employs SAR mapping rather than conventional beam scanning system. The advantage of SAR mapping is that it can provide a much better target resolution than conventional beam scanning method. Also it can detect more no of targets than the former method. In conventional beam scanning pattern, if 2 targets are in very close proximity the scanning pattern is unable to identify them as 2 different targets, but in SAR mapping targets0in close proximity can be clearly identified and treated as 2 different targets. The Image resolution provided by SAR is directly proportional to the radar bandwidth. So the more the signal bandwidth, the better the pixels of the target image pattern. Another advantage of SAR mapping is that it provides REAL TIME IMAGE to the pilot because the received signal pattern is completely coherent and minimum time delay occurs through the whole process.